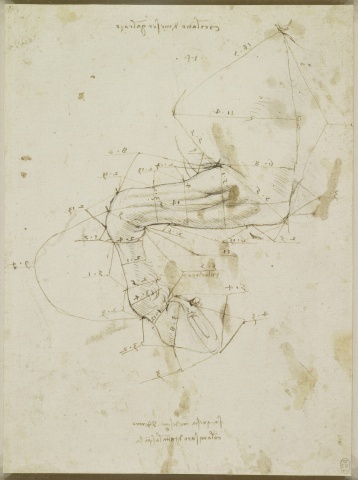 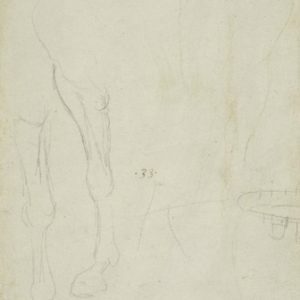 A study of the near fore-leg and shoulder of a horse, in profile to the left, the leg raised and bent, the hoof upturned; divided into sections with measurements below; with two notes. 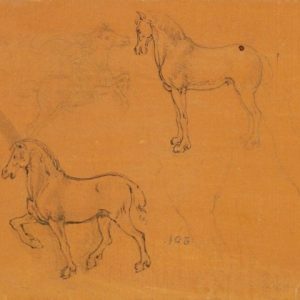 Most of Leonardo’s measured drawings of horses show the animal standing with all legs straight, but a few study in detail the dimensions of the raised left foreleg. 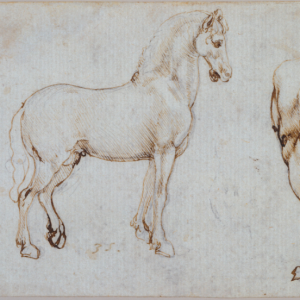 This was the intended final form of the equestrian monument commissioned from Leonardo by Ludovico Sforza, the ruler of Milan, to commemorate his father Francesco. 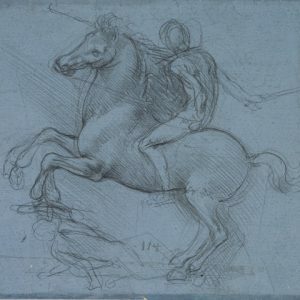 The note at the top of the sheet identifies the horse measured as a Sicilian belonging to Galeazzo Sanseverino, the Captain-General of the Milanese army.